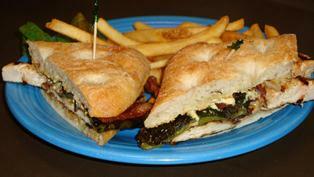 *All our burgers can be made with either Colorado-grown all natural Angus beef patties or chicken breast. Lettuce, tomato, onion, pickle and a side included. A half-pound burger topped with our own hot & sour sauce, cheddar cheese, crispy bacon, grilled pineapple ring and served on a Kaiser roll. A half-pound burger topped with cheddar & swiss cheeses, crispy bacon, onion ring, tsunami sauce(spicy) and served on a Kaiser roll. A half-pound burger topped with bleu cheese, crispy bacon, buffalo sauce, blackened spice(spicy) and served on a Kaiser roll. A half-pound burger topped with cream cheese, crispy bacon, jalapenos and served on a Kaiser roll. 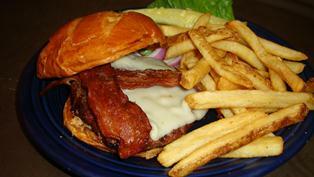 A half-pound burger topped with pepperjack cheese, crispy bacon, guacamole, pico de gallo and served on a Kaiser roll. A half-pound burger topped with jalapeno mustard, garlic mayo, crispy bacon, roasted poblano pepper, pepperjack cheese and served on Focaccia bread. All beef patty, marinated chicken breast, or portobello mushroom. Substitute veggie patty for extra. Toppings you can add: bacon, mushrooms, jalapenos, guacamole, sour cream, salsa, pork green chile, pineapple, poblano pepper, pico de gallo, cheddar, provolone, swiss, pepper jack, bleu cheese crumbles or queso.